The works of Baroque, Classical, and Romantic composers are essential to a well-rounded study of piano. When we look to the past for great music, though, we shouldn’t forget the more recent past. The Modern Era, starting around the turn of the 20th Century, includes many innovative composers whose distinctive works opened up new musical possibilities. Though they don’t boast centuries of history like music from earlier eras, music from the Modern Era has most definitely played a part in shaping music history. Adding piano sheet music from this era to students’ repertoires also brings variety in style and sound, and its relatively recent origins can pique students’ interest. Being able to place the compositions into historical contexts they are more familiar with helps the music come alive to them in a unique way. The ten Modern piano sheet music pieces below represents a wide range of works of the Modern Era arranged for Easy/ Intermediate piano. From ragtime to orchestral to Broadway musicals and film scores, the composers and pieces below have helped shape Modern music, and some are recognized among the greatest compositions of the Era. Learn more about the lives and contributions of the composers above and composers from other eras by visiting the Meet the Composer index on MakingMusicFun. Some sources may say that the Modern Era ended decades ago, but others contend it continues into the present time. Either way, these pieces demonstrate that music doesn’t necessarily need to be old to be excellent. Even some of the musical and film score pieces on the list are recognized as the best of their genre, and they represent new facets of musical expression that were introduced during this era. Incorporating piano music from the Modern Era into your students’ lessons can stoke their enthusiasm. It can also demonstrate how music changed through the decades as well as the qualities that have always made great music great, regardless of time or place. What’s popular isn’t always best– but it’s often popular for a good reason. If you’re making a purchase, checking out the best sellers just makes sense. People must love them for a reason! 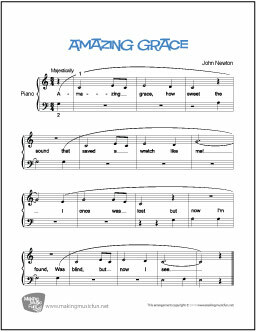 Which beginner sheet music made the top ten list? Let’s count down the top-ranking favorites. 10. 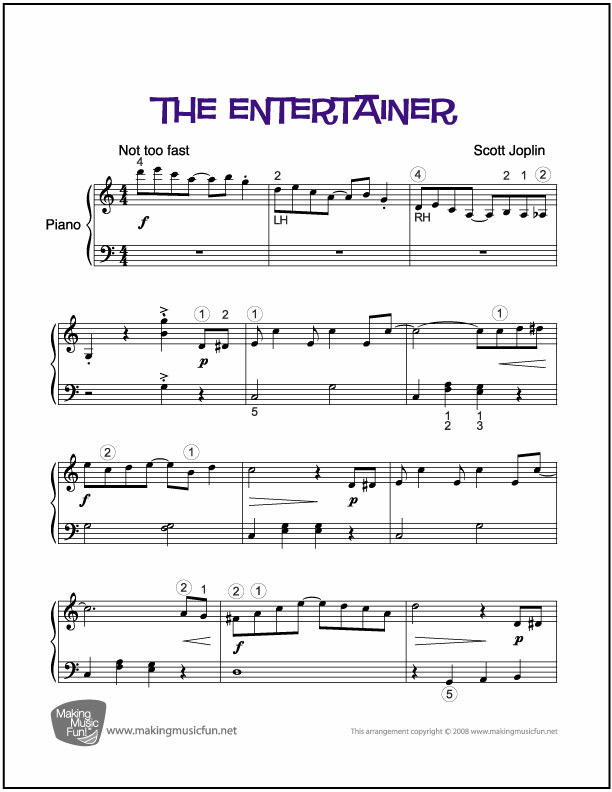 The Entertainer (Joplin) | Sheet Music for Easy Piano Solo This one is on the more challenging side for beginners, but young pianists love this arrangement of the ragtime classic. 9. 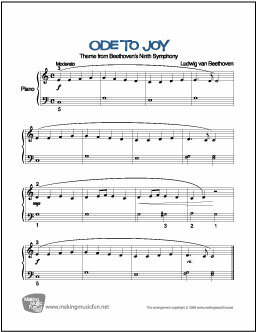 Ode to Joy (Beethoven) | Sheet Music for Easy Piano (Digital Print) It’s no surprise that this simple arrangement of Beethoven’s famous melody made the list. 8. Frère Jacques | Traditional This approachable arrangement of the familiar French tune is a popular choice for beginners who are very early in their piano career. 7. 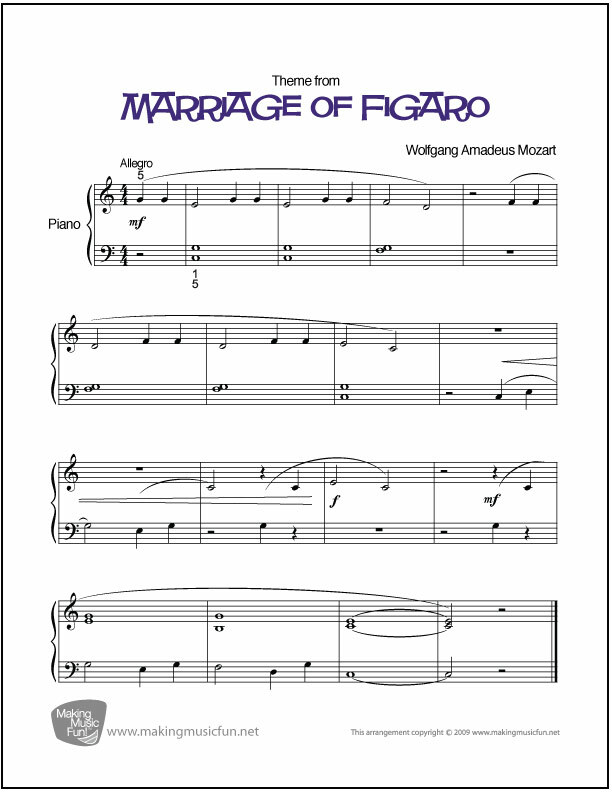 Marriage of Figaro (Mozart) | Sheet Music for Piano (Digital Print) The title might be a bit of a surprise, but the composer certainly isn’t. And when you hear the satisfying pattern of the theme, you’ll see why this is a frequent choice for beginners. 5. 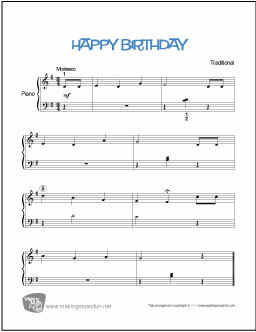 Happy Birthday by Patty Hill and Mildred J. Hill As long as there are birthdays, Happy Birthday sheet music will be a staple in every music library, beginner and beyond. 4. 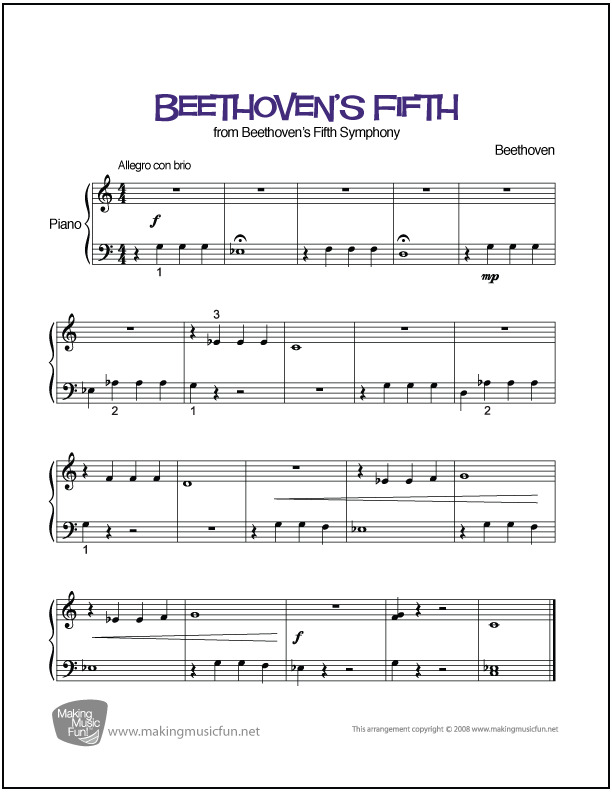 Beethoven’s Fifth by Ludwig van Beethoven Back to Beethoven for number four, and for the most recognizable first four notes ever written. 3. 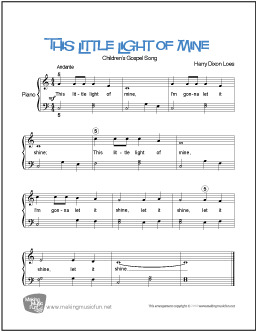 Twinkle, Twinkle Little Star | Nursery Rhyme Many piano-playing adults recall this song as one of their first, and the tradition appears to be continuing. 2. 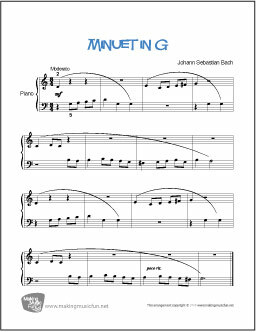 Minuet in G by Johann Sebastian Bach There’s lots to love about this Bach number. The rise and fall of the flowing melody, the smooth legato phrases, and the running eight notes are both pleasant to listen to and helpful to practice. Everyone has their own top choices for their beginning piano students, but hopefully this list provided some new options. Based on hundreds of piano teachers and students, these ten pieces of beginner sheet music are tried and true. Few instruments can steal the show like a trumpet. Composers love to give them triumphant fanfares, dramatic melodies, and standout solos within band and orchestra pieces. Young trumpeters can get a taste of that excitement by studying a variety of easy trumpet solos. Trumpet teachers can provide that variety at no cost with the excellent free trumpet solo sheet music below. Each solo is a free pdf download with piano accompaniment. Whether your trumpet student would enjoy something regal like Mouret’s “Rondeau,” made famous by Masterpiece Theater, something mournfully melodic like “Scarborough Fair,” or something challenging and technical like the “Can-Can,” there’s a perfect selection for everybody. Expand your trumpet players’ repertoires with these classic selections. All of them make show-stopping recital selections, but trumpet students will enjoy these pieces in any context. Trumpet players love dynamic, memorable music, and each of these pieces certainly fits that bill.